Alice's Adventures in Wonderland, often shorted to Alice in Wonderland, was first published by Lewis Carroll in 1865. The popularity of the tale shows no sign of diminishing, however. Alice in Wonderland paper crafts give you a chance to decorate for a Wonderland-themed party or to simply express your appreciation for a classic work of children's literature. In Alice in Wonderland, Alice encounters three playing card suitors who are busy painting white roses red. They've been ordered to complete this nonsensical sounding task by the Queen of Hearts. Cut a large circle shape from your paper. Trace a spiral pattern along the circle and cut it out. 2. Starting at the outermost spiral, coil the paper around the end of a pencil. 3. When you get to the inner part of the spiral, carefully slip the spiraled paper off the pencil. Let it uncoil as desired, then hot glue the bottom together to keep it secure. 4. Use red watercolors to add a touch of color to your paper rose. Glue the rose to green paper leaves, if desired. Click on the image below to open the printable PDF file with instructions for this project. If you need assistance, use this Guide for Addobe Printables. 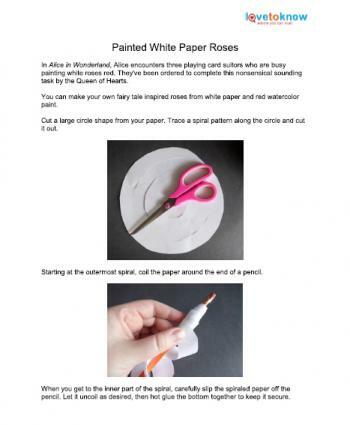 Download or print instructions for the paper rose. 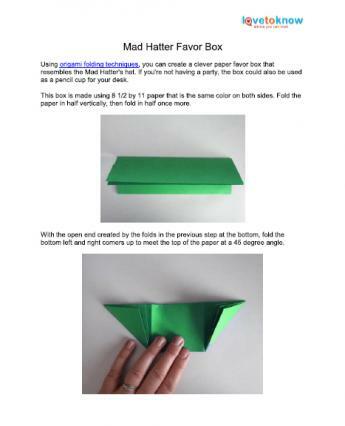 Using origami folding techniques, you can create a clever paper favor box that resembles the Mad Hatter's hat. If you're not having a party, the box could also be used as a pencil cup for your desk. 1. 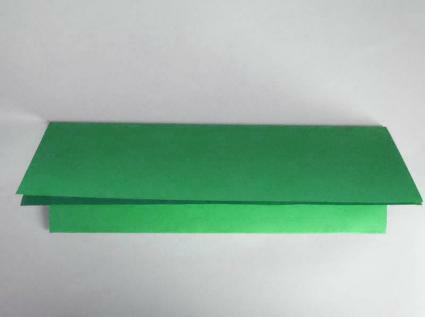 Fold the paper in half vertically, then fold in half once more. 2. 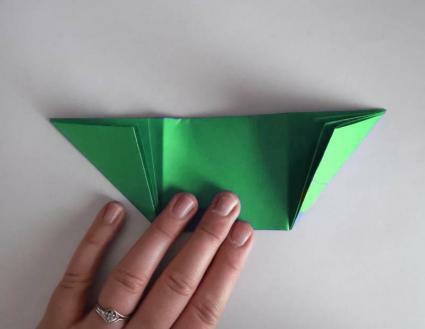 With the open end created by the folds in the previous step at the bottom, fold the bottom left and right comes up to meet the top of the paper at a 45 degree angle. 3. Partially open your paper so it's folded in half. Fold the lower corners up along the previous creases. Fold only the top layer of the top corners down, using the previous creases as a guide. 4. 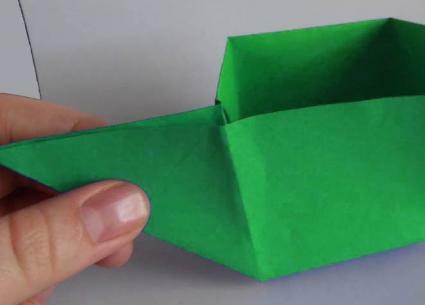 Fold the top layer of the paper down and stick your fingers inside the pocket this fold creates. Pull the paper out as you push the sides in. Fold the remaining edges up and push out the corners. Tuck the corners into the triangle flaps at the side to complete the box. 5. 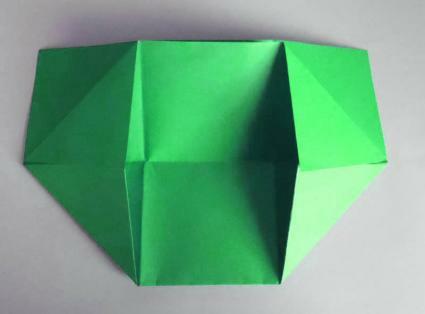 Glue the box to a coordinating square of paper to make a hat shape. 6. Run a strip of colored washi tape around the bottom to create a hat brim. 7. Tuck a small card that says "10/6" into one side of the brim to complete the look. You can print out a free sheet of instructions, with photos, to make this Mad Hatter paper project. Just click on the image below to open the PDF file. Click to download instructions for the Mad Hatter project. The playing card suitors are Wonderland residents who serve as guards for the Queen of Hearts. Hearts are members of the royal family, spades are gardeners, diamonds are courtiers, and clubs are soldiers. 1. Cut a large heart from red construction paper. The heart should be slightly larger than your playing card. 2. Fold the rounded tops of the heart down over the playing card. Slip half of a red pipe cleaner underneath and bend it to make arms for your figure. Glue the card and pipe cleaner in place. 3. Glue an upside down heart to the top of the playing card to make a face for your figure. Use a black marker to draw a face on the heart. 4. Cut two small red squares of paper. Fold them in half, make small notches in the middle, and slip them onto the figure to make feet to stand your project upright. If you would prefer to use this idea to make party invitations, you can either omit this step or cut out flat rectangles to use as feet. Download these instructions for later use or print them out right away. Simply click on the image below to open up the PDF file with the directions to make this paper craft. 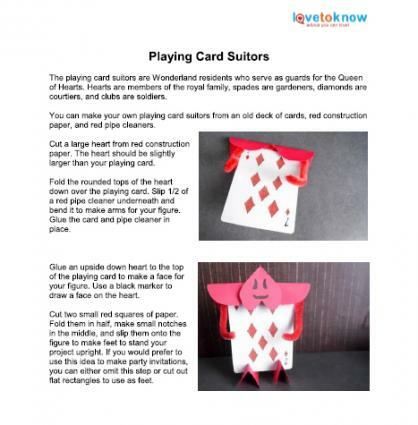 Click to download instructions for the Playing Card Suitors. Time operates rather strangely in Wonderland. When Alice encounters the Mad Hatter and looks at his pocket watch, she says, "What a funny watch! It tells the day of the month, and doesn't tell what o'clock it is!" The Mad Hatter also reveals they have tea all day because Time has punished him by always standing still at 6 pm -- which is the designated tea time. 1. Print out the clock template onto white cardstock. Click on the image below to download the printable PDF file, which also contains instructions to put the project together. 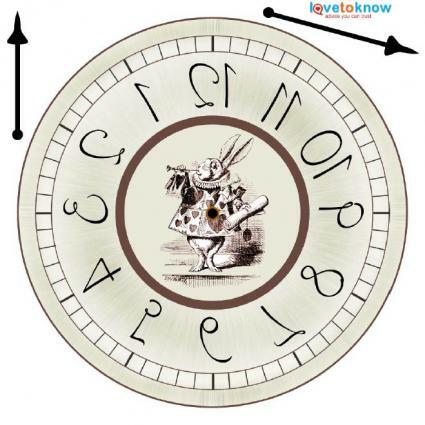 Click here to download the Wonderland clock graphics. 2. Carefully cut out the clock face and clock hands. Attach the hands to the clock face with a brass plated fastener so they can be moved around at will. Over the years, Alice's Adventures in Wonderland has been interpreted in several different ways. Feel free to add your own unique spin to any of the project ideas featured here. By making the story of Alice your own, you'll be honoring Carroll's work in the best way possible.